I was in conversation with comix artist Andy Mason (aka N.D. Mazin) at the launch of his graphic novel The Legend of Blue Mamba at the Homecoming Centre in Cape Town during the Comic Fest at the Open Book Festival, 8 September 2013. The genesis of the graphic novel was in the comic work produced and published in various print, surfboard art and online since the mid-1990s. The first appearance of the Blue Mamba character was in the first issue of the now defunct African Soul Surfer in August/September 1995. This was my first encounter with the Blue Mamba’s subaltern surfing adventures. 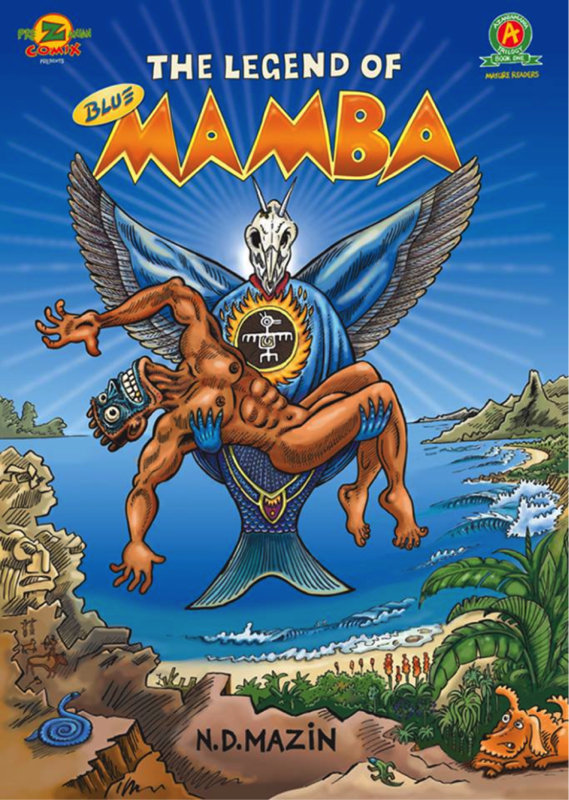 My interest in The Legend of Blue Mamba is how Mason takes a countercultural and environmental activist surfing identity and creates an anti-brand through Blue Mamba in a surfing world where lifestyle consumption drives how the image of surfers, and surfing, is manufactured and maintained by the surf industry and surf media. The Legend of Blue Mamba is a cautionary tale of the commodification of the surfing dream. Other themes addresses in conversation were: the character of Blue Mambas as “an empty signifier of meaning and identities”; how in the post-apartheid era progressive cartooning has taken to satirical critique of brands as they represent and determine lifestyles today; how surfing can be used to offer critique to consumer and highlight environmental injustices; why the Sixties is still politically and culturally relevant today; representation of the “author” in cartooning, especially as “a character is not the author”; the idea of parallel narratives in comics and how that can drive the storytelling; and how the graphic novel draws from the realism of the experienced world adds to the comic imagination.